This entry level Fancierstudio Power Heat Press will allow you transfer your own printed images with heat transfer paper as well as your vinyl heat transfers and your rhinestone transfers! With the Fancierstudio Power Heat Press, you can customize your own t-shirts, sweatshirts, mouse pads, ceramic tiles, coasters, and so much more! This heat press works great in both commercial and domestic settings, and it can perform any size job with supreme durability. The "strong handle" design allows for easy and sturdy operations. When pressed down, it provides industrial strength, pressure, and even temperature to the surface, guaranteeing the transfer to last on the garment. 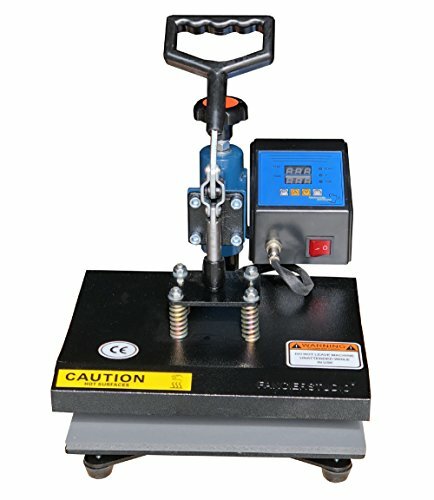 The Fancierstudio Power Press Heat Press is easy to operate and provides professional results. If you're making shirts for your family or for your clients, the Fancierstudio Power Heat Press will make a lasting impression! Blue Black Color. If you have any questions about this product by Fancierstudio, contact us by completing and submitting the form below. If you are looking for a specif part number, please include it with your message.